This post was originally published in Heather Bruggeman's Whole Food Kitchen online workshop. Three summers ago I came to a startling realization. That summer, after a particularly busy week, I figured out that I spent 8 hours per day doing kitchen related work - planning, buying or preparing food. Eight hours! That's a full time job. And it was. You can go read that link if you want to know how I arrived at those numbers. I included time spent menu planning, shopping, working on our buying club, in addition to time spent chopping and stirring. That was a bit of a wake up call for me. If you're thinking, "I could never spend that much time cooking". Don't freak out. You don't need to! Unless or course you want to. My kitchen work involves community building also - hospitality, buying clubs and this takes extra time. Other people might spend lots of hours canning and preserving. 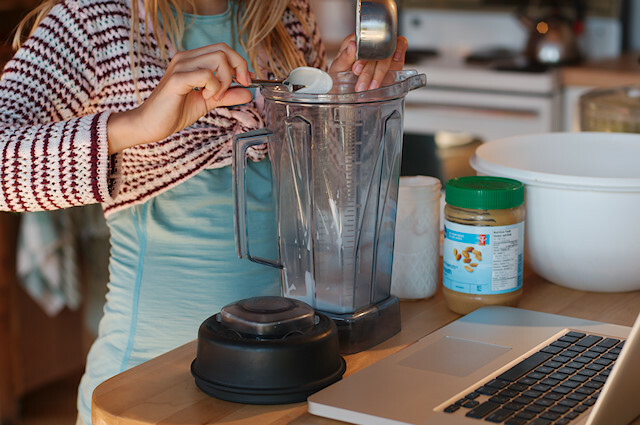 As much as I value kitchen work and feeding my family, I realized that if I was going to work towards some of my other goals, growing what has now become my writing and coaching work, I needed to spend less time in the kitchen. So I asked myself - how can I spend less time in the kitchen, while still preparing and eating healthy whole foods? There were a couple answers to this question. 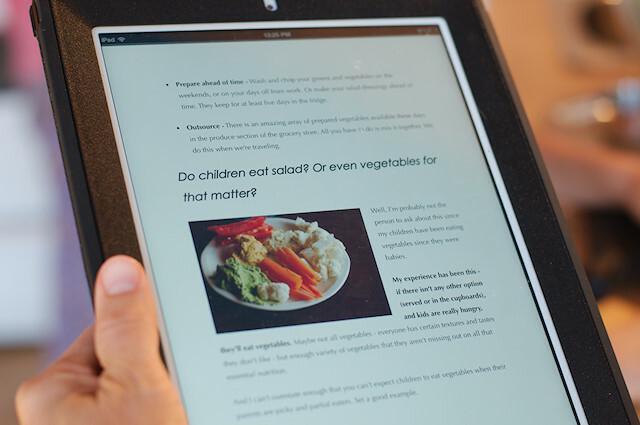 Simplify - specifically menu planning and snacks. In short, I started rotating meals regularly and spent less time trying new recipes. I also stopped baking. We reprogrammed ourselves to reach mostly for fruit and nut snacks that didn't require much preparation. It was not just my personal desire to spend less time in the kitchen that got me thinking how to involve my kids in the kitchen. Reaching the peak of my kitchen work happened to coincide with our kids reaching a good age to be a real help in cooking. Not to mention, one of our goals when they eventually leave our home is that they will be proficient cooks. That doesn't happen without teaching and practice. My children are 9, 11 and 13. But I had little ones once. In this section I will share tips for involving little children in the kitchen, however I won't spend a lot of time discussing this since there are some great articles on the web that address this very thing. 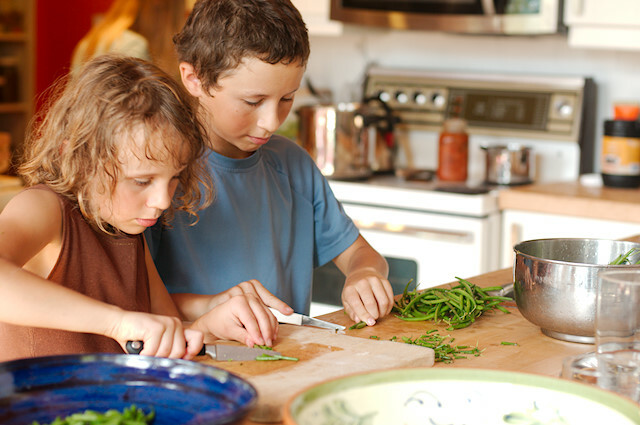 Kids can help in the kitchen as soon as they are old enough to stand on a stool next to you. I will warn you though, and you probably know this already, when they are little tykes it won't be that much "assistance". There are different ways to deal with this reality. Give little kids "busy work". They want to be in the kitchen because it's where you are and because they have a natural curiosity and drive to learn. But they also want to make messes with their hands - this is a natural part of their growth and development. Teach them to clean up their messes. This is crucial. Kitchen work generates a lot of mess. If your littles want to help you, teach them to clean up their mess when they are done. Throw peels in the compost, wipe the counter, etc. At first this will take more time but it will save you time in the long run. Let littles come and go as they please. If you want to teach them to complete tasks give very small tasks at first. If it doesn't matter to you (it didn't much to me) let them come and go as they please but make sure they clean up whatever mess they made while "helping". At this stage, it's important to keep the long range goal in mind. If you are forever shooing young children out of the kitchen it will be harder to invite them back in when you truly do want their help. Even if you want to mostly cook alone (because let's face it, sometimes it's just too much to manage with little ones in the kitchen) make sure there are times when your children are able to help. Now that I've talked about involving young children in the kitchen I want to talk about what I do at this stage with school aged children. We are a homeschool family so some of what I share is quite specific to that reality. For example, my kids help make lunch during the day when we are all home together. I think these ideas can be applied though to whenever you make meals in your home. If lunchbox prep is done the night before you could try some of these strategies during that time for example. In the case of kitchen assistance someone else, aka: mom, is doing the brain work of thinking and planning. All that's needed is someone to "do the work". 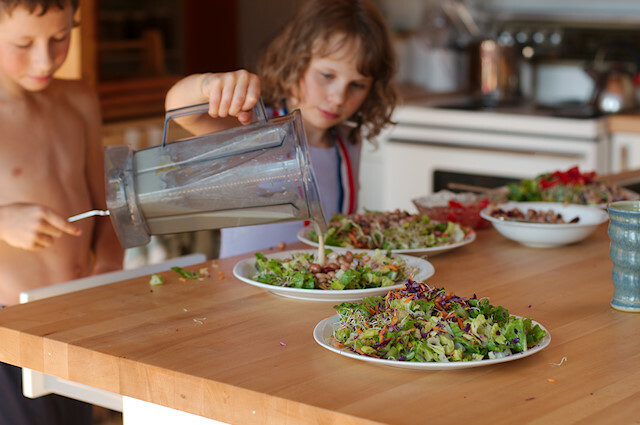 If you'd like to know more about eating meal sized salads (and involving your family in making them) I recommend my e-book Eat This: Meal Salads and Whole Food Dressings. There are a lot of jobs in the kitchen that simply require labor. These jobs don't require inspiration, planning or a lot of thinking. They just require doing. This is where those earlier years of having little ones "helping" are going to pay off. A couple extra trained hands in the kitchen is really very helpful. Payback time! As I mentioned, we have three children. Our youngest shows the most promise (so far) to be a natural cook. A note about "natural cooks". I honestly believe some people are just more naturally interested in cooking food. It's art for them or maybe just fun to mix things up and see what you get. These are the people who inspire us with their beautiful food blogs and cooking shows. Right now, our youngest daughter is like this. She enjoys fooling around in the kitchen. She's the one who wants to try new recipes and experiment with different ingredients. I call this independent inspiration. I don't require this assistance but absolutely encourage it! I try to involve this daughter as often as I can when I'm trying new recipes. I also give her a lot of freedom to experiment in the kitchen. She has crafted some of our family's favorite recipes, including Brienne's Miso Soup. Making a meal once a week is a new routine in our home. After I did my kitchen accounting those three summers ago I tried assigning a whole meal to my then ten year old daughter. That experience was not all that successful. Many children the world over are cooking for their families by this age. I'm afraid though, that as much as my children have been with me in the kitchen for years, she wasn't ready or naturally interested in taking on this responsibility the first time around. She's now at an age where even if she isn't naturally inclined this way, she's absolutely ready in terms of maturity. So we're back at it, with much more success. Let's say your kids honestly don't know how to cook. Well, now they'll learn! Be willing to start simple, in our case, pasta and potatoes. Let your child perfect a couple easy meals. And I don't mean meals from a box but simple whole food fare. These might not be as "complete" as a meal you would prepare. You can handle that by adding something to the meal. Or simply, eating what's prepared and know that complete nutrition happens over the course of days, weeks and even months, not one single meal. My goal with assigned meal making is twofold. I want my daughter to gain competence cooking actual meals, not just helping make lunch or snacks. I want her to develop a repertoire of meals she knows how to make and can do so competently on her own. Meals she likes to eat and feels good about serving to our family. My other goal is to lighten my kitchen responsibilities so I can work on other things. But first, I need to teach her through the process. Helping her choose a recipe, telling the shopper (me) what we need to buy, and being her sous-chef. Within a couple months I'm planning to work myself out of the loop entirely, except for the shopping part. Although I'm questioning this since I have really enjoyed our one-on-one time in the kitchen together. Give specific jobs. For kitchen assistance work my kids like very specific instructions, "peel and chop that carrot". Take time to teach the skills. After years of cooking, kitchen work is second nature to me. I forget that it isn't second nature to my kids. Learning takes time and requires patience. Mastery of skill comes before efficiency. I'm always looking for short cuts and more efficient ways of doing something. This comes from years of working in the kitchen. I'm learning to bite my tongue and hold my opinion (sometimes this requires quietly leaving the room) while my kids work out their own systems for doing things as they gain competence. Cooks don't clean up. This is one of my favorite family rules, and is actually a motivating factor for my daughter's assigned meal making. She is exempt from the end of the day clean up that occurs at the same time (vacuuming, etc) and doesn't have to do after supper dishes. Our exception to this is when everyone cooks, everyone usually cleans up together as well - both go faster this way. Follow your family food guidelines. Yes, cooking mac and cheese from a box is perhaps a 21st century life skill but if your family doesn't normally eat that way (or is moving away from that) don't let that be the extent of your kid's cooking. A baked potato topped with salsa is better option, and just as easy. 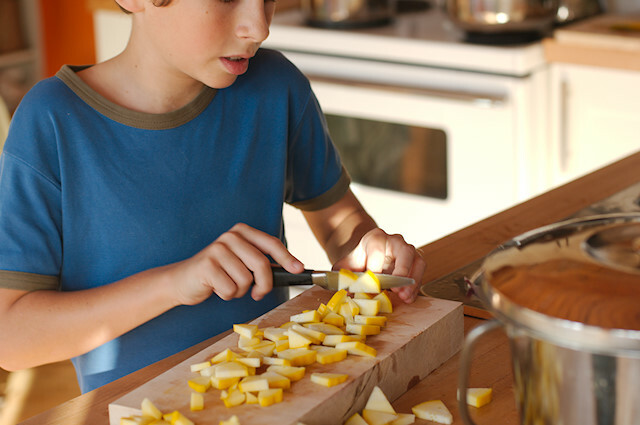 Teach your kids to cook the food you eat, not nutrition-less, processed alternatives. I always appreciate learning how other parents involve their kids in the kitchen. Rachel Wolf, a previous contributor to this course, uses a different technique. I think I'd call it Inspired Meal Making (my children have never been inspired to cook a whole meal).